Hello everyone! 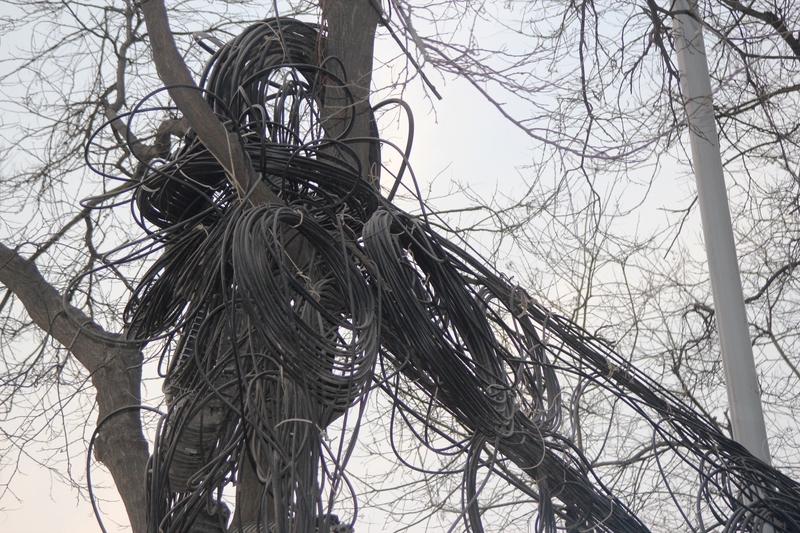 It has taken me a while to get connected to the Internet and past the Chinese firewalls. I am currently sat at Starbucks, but we should be getting Internet connection at home tomorrow. WordPress is banned here, as are Facebook and Twitter. We have set up a VPN connection, so we can access all websites we are used to. Hopefully my posts will be more frequent from now on. We have now been in Xi’an for a week and are starting to settle in after not being able to sleep at all. The mattresses in China are very hard, so it took us a while to get used to them. Our bed had some very synthetic ‘made in China’ sheets that made us feel like we’re sleeping in a plastic bag. We have just returned from a trip to a supermarket to get some better ‘made in China’ sheets. I was made very happy by two Chinese cashiers telling me I have a very beautiful nose. I think it looks like a ski jumping slope, but if the Chinese like it that must be beautiful. Maybe it’s because of the old style roof shape? So here are some stories and observations. When we arrived in the evening of Friday the 18th January we were greeted at the airport by two lovely Chinese ladies – Julia and Jennifer. 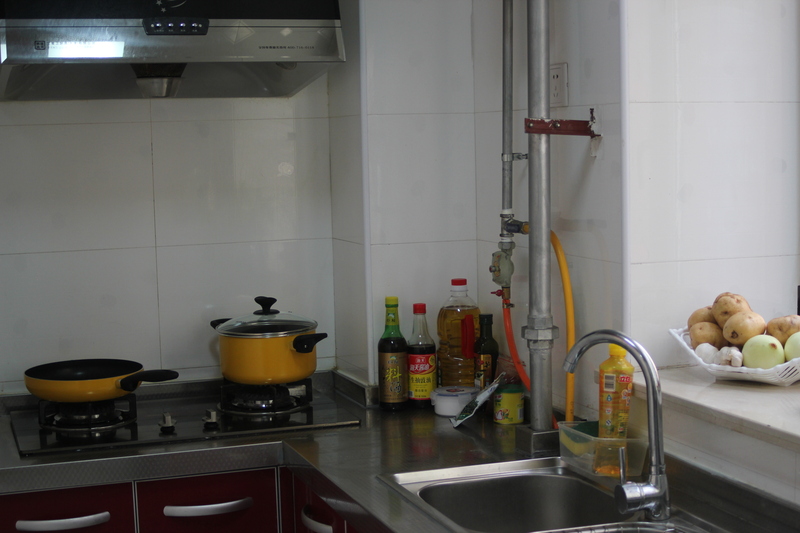 They have been helping us with everything from how the washing machine works to how to buy dumplings. As soon as we met them they handed us each a bottle of water. It soon became apparent why. 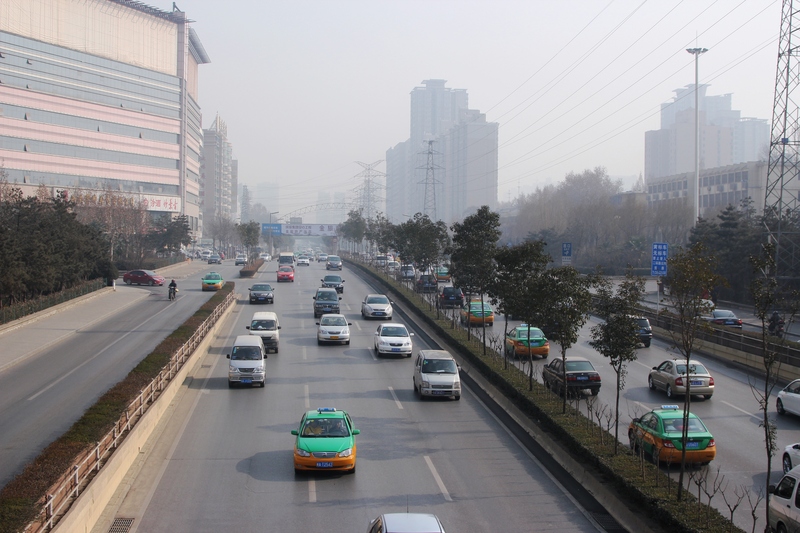 The air in Xi’an is extremely polluted with added dust and sand from deserts that surround the town from East, West and North. It has cleared up a bit by now, but for our first 3 days the visibility was about 150 metres and you could taste dust in every breath. As a result of this, a lot of people walk around with little masks on their mouth and nose (I think I will also get one instead of using my scarf); buildings look grey, inside the buildings are always dusty no matter how often you clean them. I have to keep using hand moisturiser to stop from feeling like a prune. As the air is so dry, everything is static, so I keep getting little electric shocks from everything I touch. People say the air gets better in the spring, which should arrive at the end of February. Tene, meil oleks siin väga palju tööd valgete taskurättidega asfalti puhastamisel. 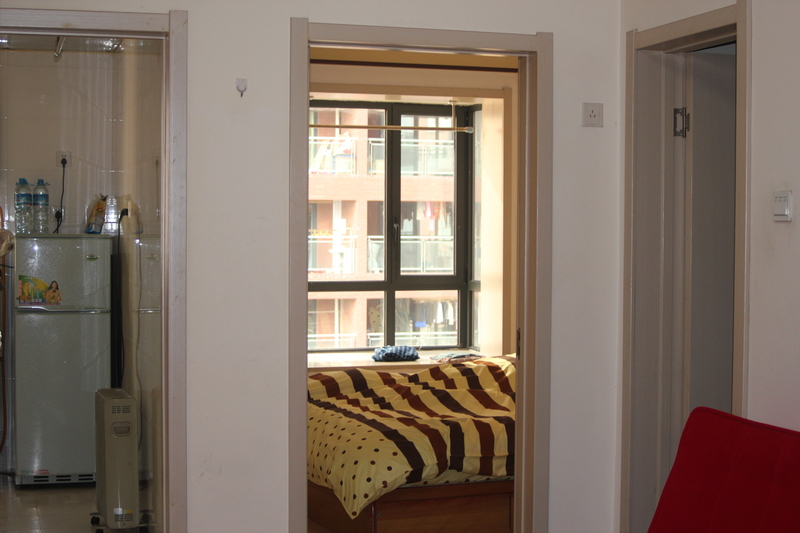 The flat has one bedroom, a living room, kitchen and a bathroom. Each house has a manager type of person and a little office, where we need to go if we run out of electricity to top it up. For gas we need to go to a Public Amenities Office (or something similar), where a little lady will put more money on our gas card. 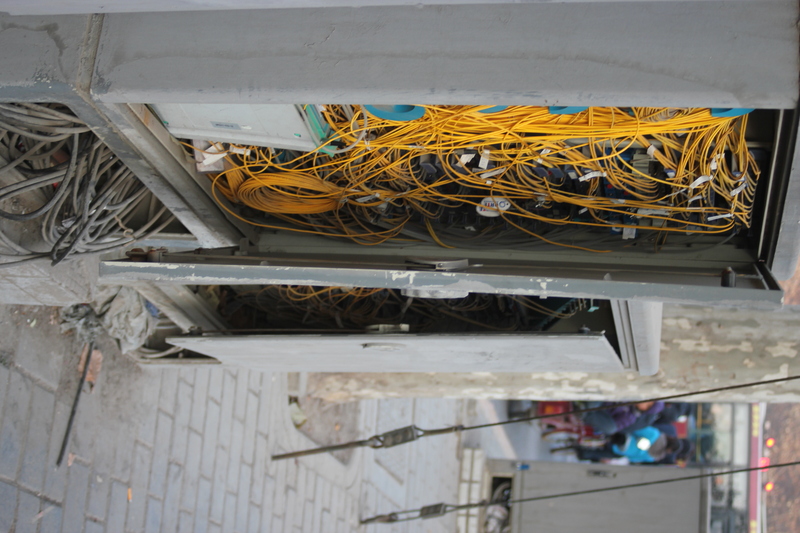 She will also top up our Internet and mobiles. Every time you do these things they need your passport. There is paperwork that needs stamps involved in everything. 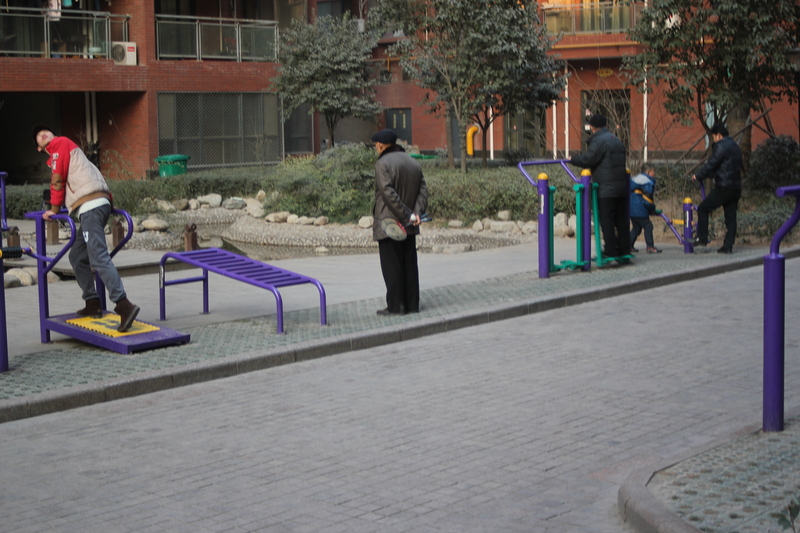 Outside our flat there are lots of little exercise machines that are used a lot by elderly people, which is really nice to see. The area we live in is home to most foreign teachers, despite that we are still a novelty and get stared at a lot. Sometimes Chinese mothers send their little children to say hello to us or when their children are crying or misbehaving their mothers point at us and all of a sudden the kids are OK again. 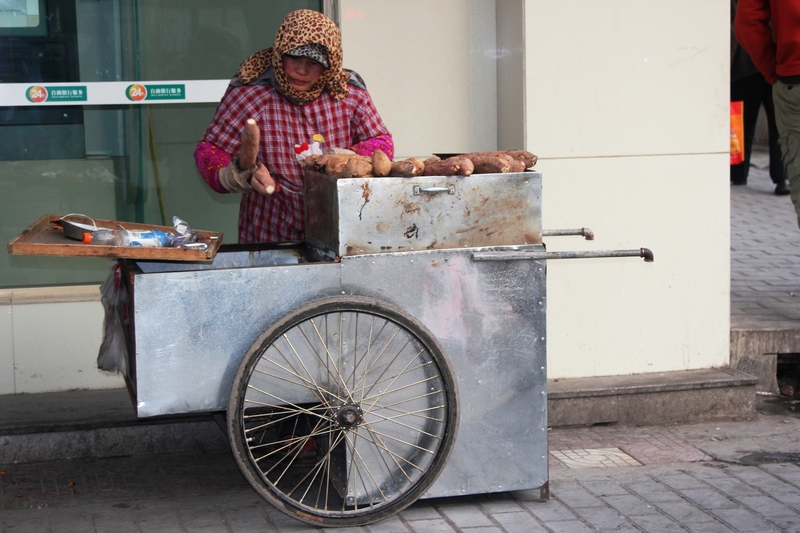 Every night around 7pm the streets become laden with vendors selling food. Needless to say, this is my favourite part. There is everything from dumplings to chicken feet to noodles to deep fried Chinese sandwiches. These street eats are really nice and very cheap in our terms. You can also find some food in the morning – I tried some spring onion pancake with ginger today and it was delicious. There are countless restaurants and fast food joints. I can now understand why there are so many eating establishments. The flats and houses in this place are so small that they don’t really lend themselves to social gatherings, so people would meet outside instead. Also, from what we have observed so far, eating out is cheaper than cooking meals at home. This is crazy, but true. 99.9% of people do not speak any English. This makes our lives quite interesting. My Chinese phrasebook has become my most prized possession, it goes everywhere with me. I have started to remember some basic words and phrases, so we can get by at supermarkets and restaurants with difficulty. I had a bit of a hissy fit today though. I was looking for an adaptor plug for my laptop at a shopping mall that is full of luxury brands and is right in the centre of town, so I thought someone in there might speak English. None of the mall employees were willing to help me until a lady who was there shopping came to my rescue with her broken but functional English. After one hour I found out that the 6 storey shopping mall that sells nearly everything has no adaptor plugs. That was a waste of an hour of my life. However, we have often noticed that people always say they speak no English, but if you push them they can speak some. They all learn it at school, but I guess they are out of practice and scared to speak, which is completely understandable, but also very frustrating. English First is the organisation that runs the language schools we work at. David works at EF4 in the North of the city and I work at EF1 in the South of the city, about 15 minute walk from our flat. 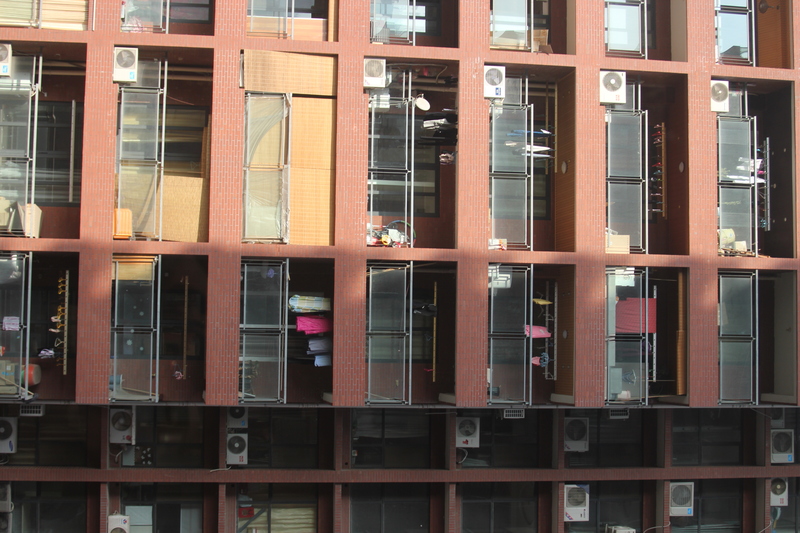 Both schools have about 10 foreign teachers and 10 Chinese teaching assistants and 700 students. They run classes for children aged between 5 and 17. David and I haven’t taught anything by ourselves yet, but we have both co-taught with more experienced teachers. The classes are really fun and the kids are so enthusiastic about learning English. There has not been a single student who has refused to try or take part in an activity. The little 5-6 year olds are so cute and full of energy. Most other teachers are from the UK. We are the first ever Estonian and Zimbabwean. Teaching was what we were worried about most before we arrived, but it’s safe to say now that that worry has nearly gone. We start work at 2 and work until 8.30 during weekdays and work from 9.30 to 6.30 during the weekend. Our two days off are during the week. Where do I begin? Sometimes it feels like we could just as well be on Mars. The general rules of anything we were used to do not apply here. People here are mobile phone obsessed. They walk around with their noses in their phones without looking where they are going. When they bump into you they don’t look up, they just carry on with their nose in their phones. There is no such thing as a queue. If you want something you just have to go and get it without thinking about anyone else. Chances are the shopkeeper or whoever’s attention you are trying to get, will avoid you like plague. They are quite shy to talk to foreigners, but once you do get their attention they are really nice and try to help as much as they can. If you’re lucky they might even dig out some English and give you a compliment about your nose. Zebra crossings mean nothing. Crossing a road is an adrenalin-filled exercise. Even the police don’t stop for you even if you are in the middle of a zebra crossing. It just does not work. We usually try and cross with some locals as they seem to know what they are doing. There are all sorts and weird and wonderful vehicles on the road that drive in any direction they please. I was hit by a rickshaw type vehicle yesterday. He did not even bother to hoot. Luckily those things are very light and luckily the driver didn’t understand Estonian swearwords. Chinese people, mostly men, are always spitting everywhere. The government tried to stop the spitting to make the place more hygienic, but I guess a habit like that won’t change overnight. So I always have to watch out for spit landing on me. It’s not just spitting that is revolting, it’s the sounds that go with it. I’m sure we’ve all done it when we’ve had stuff stuck in our throats. It’s not unusual to see a beautiful lady, looking very elegant, spitting in the middle of the street; or stopping to blow her nose in the air. I’ve also seen a lot of vomiting in the middle of streets. Bodily functions are nothing to be ashamed of over here. Hygiene is something we just need to get over. Standards are different here and there is nothing we can do about it outside our own home. The key is never to look at a restaurant’s kitchen or think about spitting when buying some food from the side of the road. As long as it’s all cooked it should be safe to eat. It’s still Christmas here. Not sure what it means for Chinese people, but it’s probably another Western thing they have grown to love just because it’s Western. So there is a truck that sprays water on the roads to keep the air a bit moist and to settle the dust. That truck plays ‘jingle bells’ to warn it’s coming. Supermarkets play ‘silent night’ and some Chinese songs where the only English word is Christmas. Shop and restaurant doors often have pictures of Santa Claus on them. It is not unusual to see people walking around in their pyjamas and slippers. They walk their dogs or babies, go to the supermarket, go get some food etc etc. I might adopt that way of dressing, it seems easier. These are not my words, these are the word of a Chinese person: ‘Chinese people eat everything. Sometimes they don’t know what they are eating.’ So what chance have I? Most things we have tried so far have been nice. We don’t know what most of them were, but we are starting to learn. There are very nice dumplings, which people love here for a snack: baoji, which are big steamed buns with meat inside and jiaozi, which are something like ravioli or pelmeenid for you Estonians. In fact they are almost identical to pelmeenid, but served with vinegar rather than hapukoor. Food in Shaanxi province is quite spicy and full of garlic. Not such great kissing food, but very tasty and completely unrecognisable from anything we ever got from Chinese takeaways in the UK. Some supermarkets sell imported food like cheese, milk and chocolate, but they are very highly priced. Chinese food is nice, but sometimes a taste of home is what we need, so we went and got some fake Nutella and coffee (instant, yuck!) and orange juice and a few other things (mostly chocolate because I did the shopping). Today I am making kartulid ja hakklihakaste. Pork is very cheap here, which is like music to my Estonian ears. There are oodles of cheap noodles of every variety you can think of and then some. We don’t know what most things in supermarkets are, but we are learning to understand. There is a Wal-Mart of course, which sells some rubbish imported things. But there is also a place called Metro which only lets in foreigners and I hear it sells real Nutella and sour cream and fresh milk from Australia that is not like white water. But as I said earlier, eating out is cheaper, so home food will be a luxury that we will have every now and then. Thank goodness potatoes are cheap here. The price of rice is not even worth mentioning because it’s so small. You can get a big bowl of noodles for as little as 80pence. Portions here are very big and I have not seen anyone finish the whole bowl. 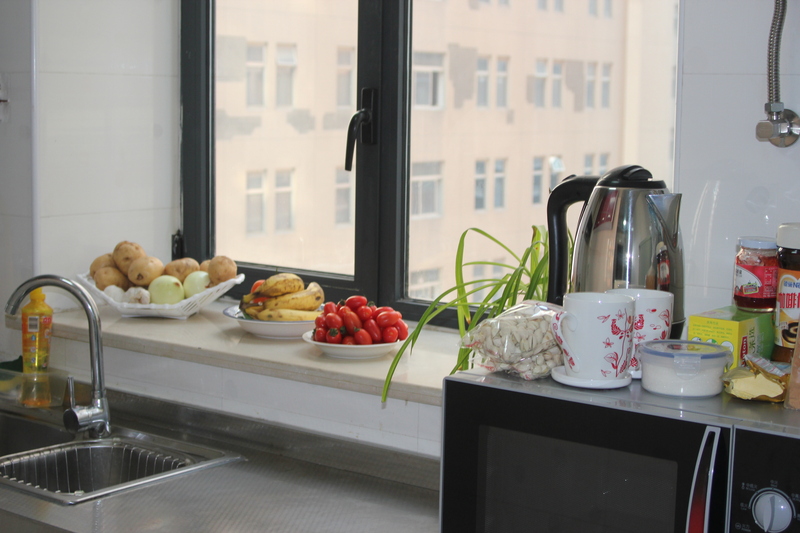 The Chinese do eat everything, but there is still a lot of food waste. People seem to have forgotten the times of hunger and poverty quite quickly. There are many rules about eating with Chinese people. If someone buys you dinner you have to make sure to leave some food in your bowl to show that you have been fed sufficiently, but not too much as that would indicate you did not enjoy the food. You must offer to pay, but not too eagerly as that again would indicate that you think the person is not able to pay. A lot of things in China remind me of stories I have heard from my parents and grandparents about life in the Soviet Union. When we arrived we had to go through a medical check (results of which are meant to come today). So our helper Julia took us to the Travel Clinic, where all foreigners need to go and all Chinese who want to travel abroad. We filled in a form, had some photos taken, had our form stamped, filled in some more forms, got some more stamps and had some more photos taken and then we could start with the procedures. We had a blood sample taken, an ECG, our eyes were tested, we were weighed and measured, our blood pressure was measured, we had a chest X-ray and we also had a stomach scan (no babies yet). When we get satisfactory results to all these tests we can apply for the correct visa (we are currently on a temporary one). We then went to open a bank account, where we filled in some forms again and showed our passports. Every time we need passport (which is all the time) I get into trouble because nobody knows Estonia. They don’t even know it when they translate it into Chinese. When I tell them it’s a country of 1 million they look at me like I’m somekind of villager (maakas). Anyway, we got our bank accounts. We then needed to get a metro card, which you get from a bank, of course. So we went to Bank of Xi’an, which is designated to issue metro cards. We paid 50RMB and showed our passport and got our cards. We then had to register with the police in our neighbourhood, so they know we are here and can keep an eye on us. So we went to the station, filled in forms, showed passports, explained about Estonia, which indeed is not the same as England, and we were registered. 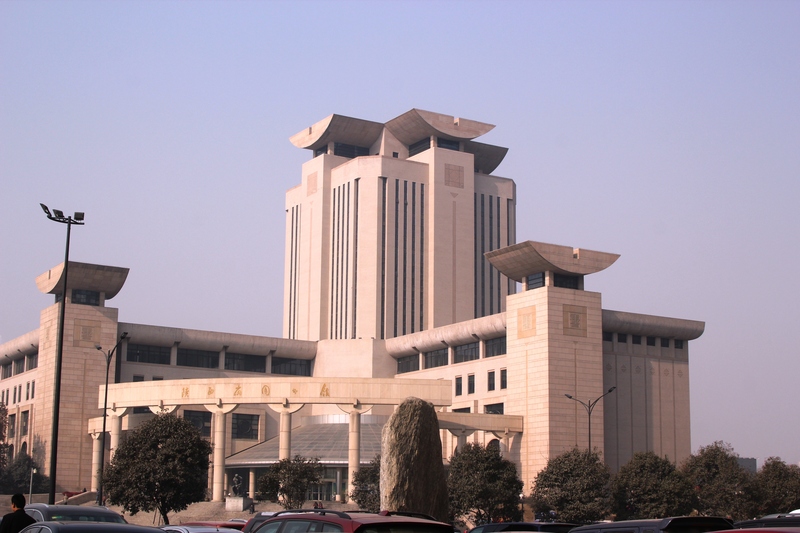 Apart from all these procedures you can see some massive buildings that are usually government agencies with Chinese flags flying high, sickle and hammer and the red star in their place and guards outside. There are communist slogans in the streets (in Chinese, but I am sure they say things about working hard and fighting for the motherland). We are not meant to talk to our students about the government too much or mention religion, Mao or Tibet. I did ask Julia what she thought of the new premier. She said he is nice, but then quickly moved on to talking about his famous singer wife. However, along with communist symbols and procedures you can see so much capitalism. There are huge Gucci, Prada, LV and whatnot shops all over town centre. Supermarkets sell luxury brands (we even found a Calvin Kleiln mattress today), so these obviously mean a lot here. Everyone has something branded, fake or not (usually fake). So I am not sure if this is communism with capitalist characteristics or communism with Chinese characteristics, which is what they strived for when the reforms started. It will be interesting to find out what the Chinese people think of communism and capitalism. I am sure we will soon learn more once they open up a bit more. I have already bribed Julia with chocolate and deep fried sweet potato cake. Julia did say that bribing is very common here, but she can’t afford to do it and she doesn’t like it. I would also like to find out what the locals think about the ancient Chinese history as they seem to be worshipping anything modern at the moment. 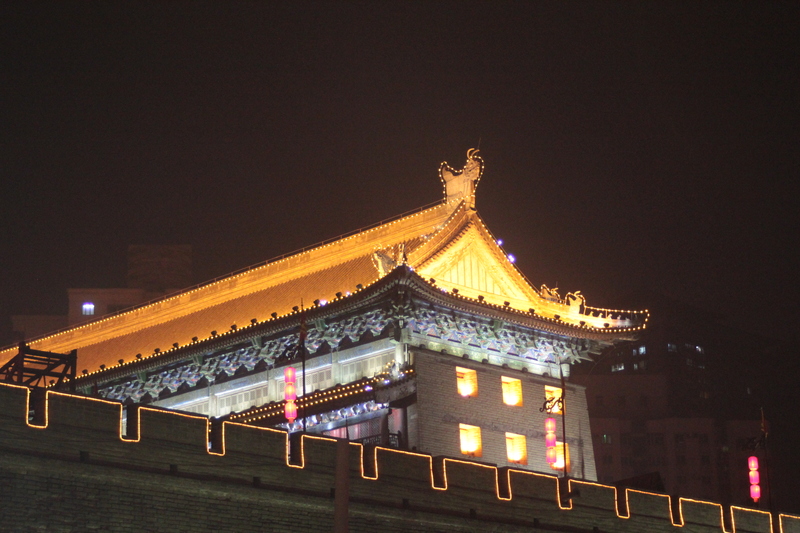 There are still a lot of old buildings and sites here in Xi’an, but I am not convinced they are appreciated as much as they should be. China likes to do a lot of things their own way. 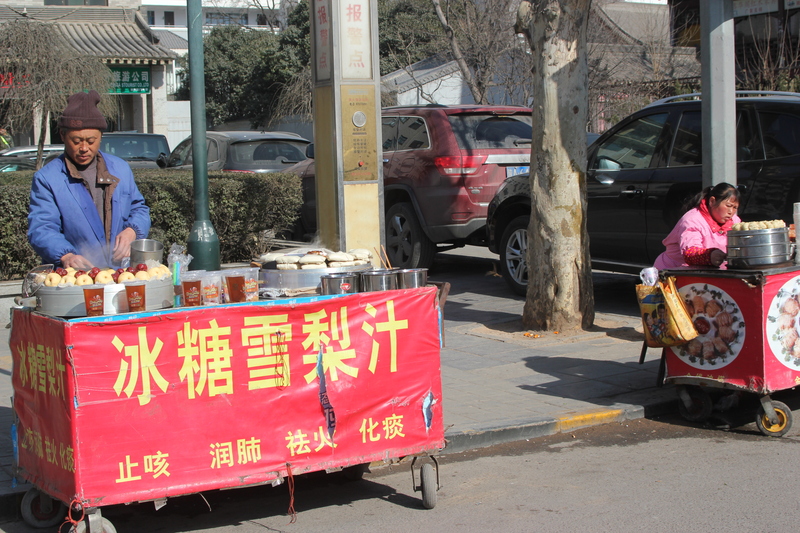 Most places in Xi’an don’t accept Visa cards, which are a normal method of payment in any other country of the world (but for North Korea and Burma perhaps). 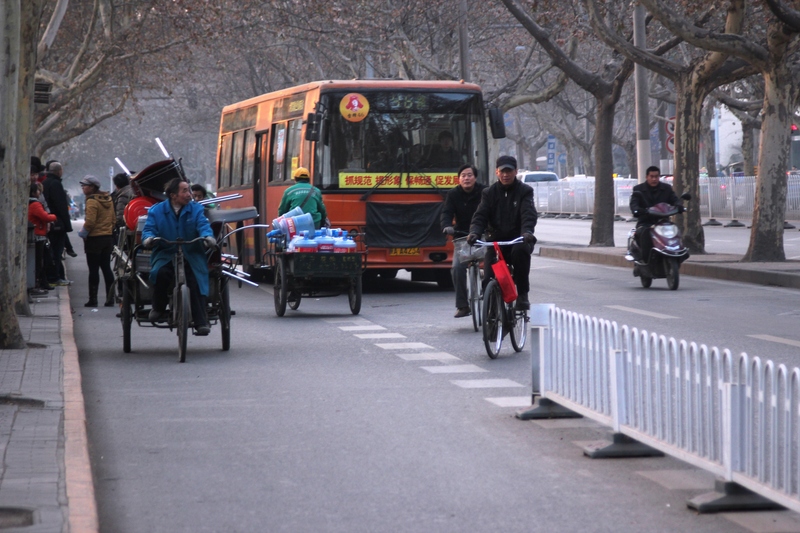 We see a lot of cars here that look like cars we’ve seen, but are actually Chinese made offshoots of those cars. Same with mobile phones, clothes and anything really. I also noticed that fashion in China is very different from Europe and America. They like everything shiny and colourful and mismatching and just weird. 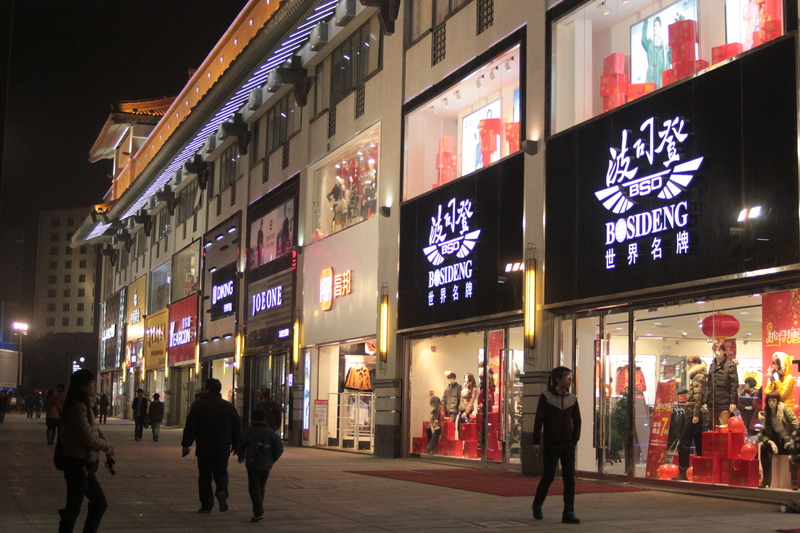 Chinese shops and malls are like theme parks with loud music playing, luminous adverts and TVs everywhere. They are playing the music extra loud at the moment to make people feel happy for the upcoming Spring Festival. There is no place like it. 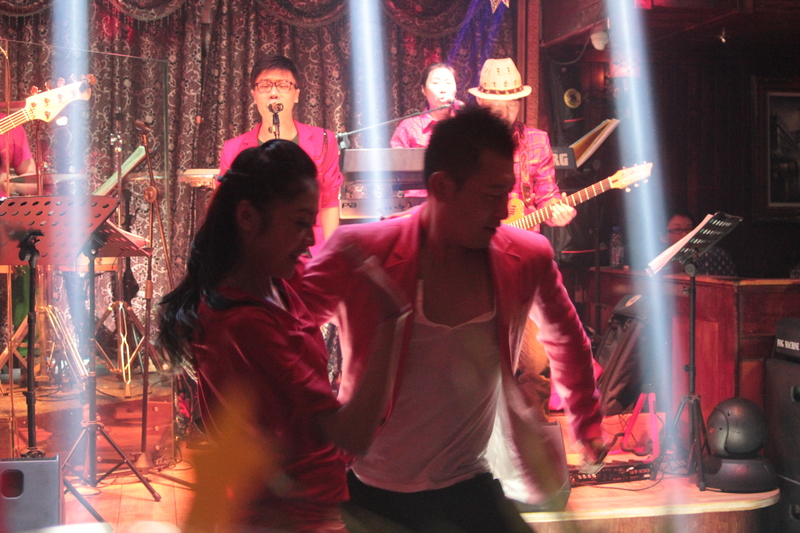 The only thing China has in common with the rest of the world is Gangnam Style. 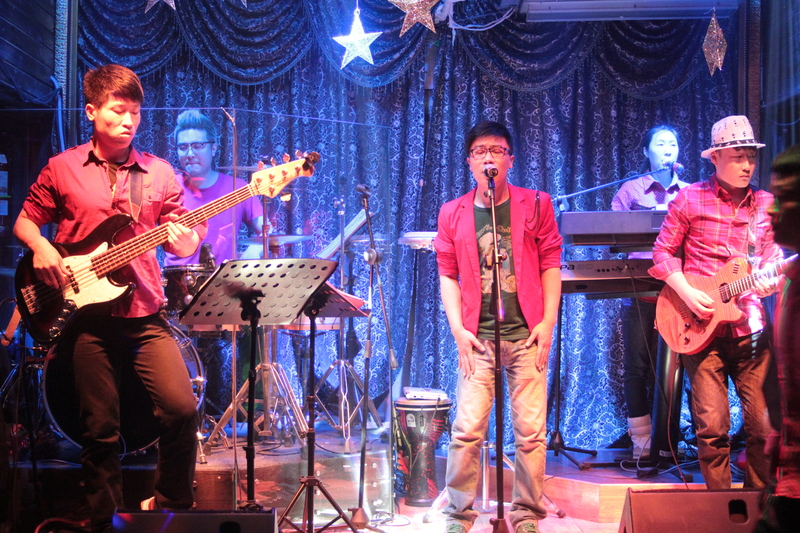 A Chinese salsa band. I have now seen everything (I have a feeling I will say this again and again). There was also a Colombian band and I found out there are a lot of Venezuelans here (must be the friendly communist ways of Mr Chavez). We haven’t done any touristy things yet. 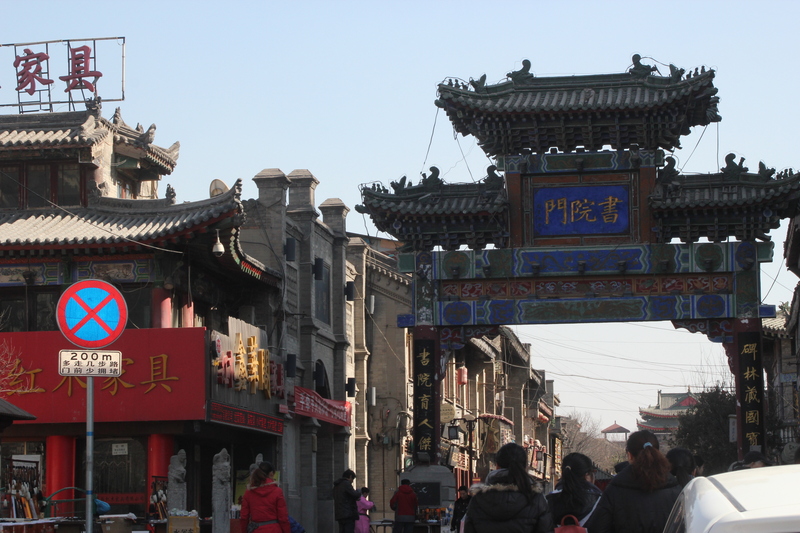 Xi’an is meant to be the cultural capital of China, they get a lot of Chinese tourists here. 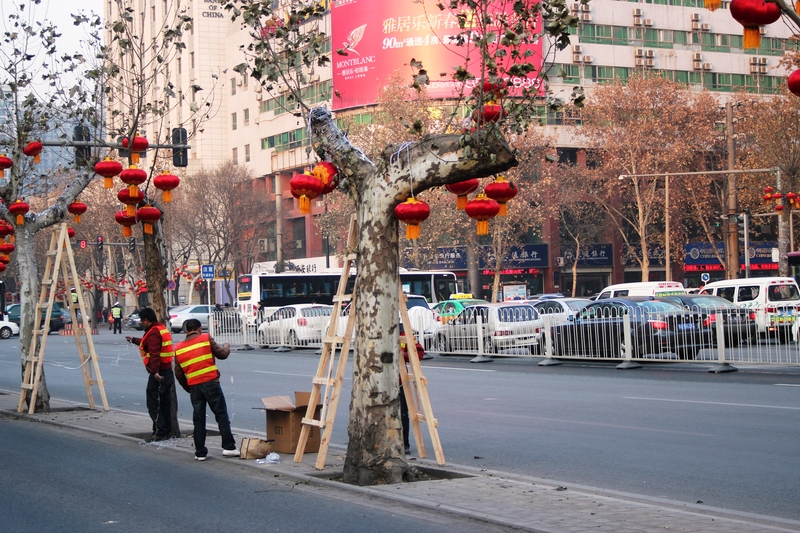 At the moment the city is getting ready for the Spring Festival, which will be a 7 day holiday. The whole place will be lit up and covered in Chinese lanterns and fireworks. David and I will most likely stay in Xi’an and be tourists, maybe go see the terracotta army. I broke my tooth yesterday, so now I have an extra beautiful smile. No idea how it happened, but half of it fell out for no reason. Communist countries are meant to have very good healthcare, but I am a bit sceptical about dentists here. I’ve walked past a few of them, they do all the drilling and fixing right by the window where everyone can see. I have had a cold ever since we arrived in Xi’an, so I’ve been coughing and blowing my nose non-stop, which has made breathing in this air even harder. Good thing I brought some sinepiplaaster from Estonia. This is the first time David has lived off the ground floor in an apartment block. He doesn’t particularly like heights either, although it doesn’t feel like we’re very high (10th floor really is not) because we are so close to other buildings. But us Soviet Estonian kids are well used to living in concrete blocks. However, most Chinese kids here don’t have grandmas in the countryside to spend the summers with. Anyway. I seem to have written a lot of negative things about our first week. It has certainly been different and will take more time to get used to, but we’re happy to finally be on this adventure and look forward to getting to know the place and people better. 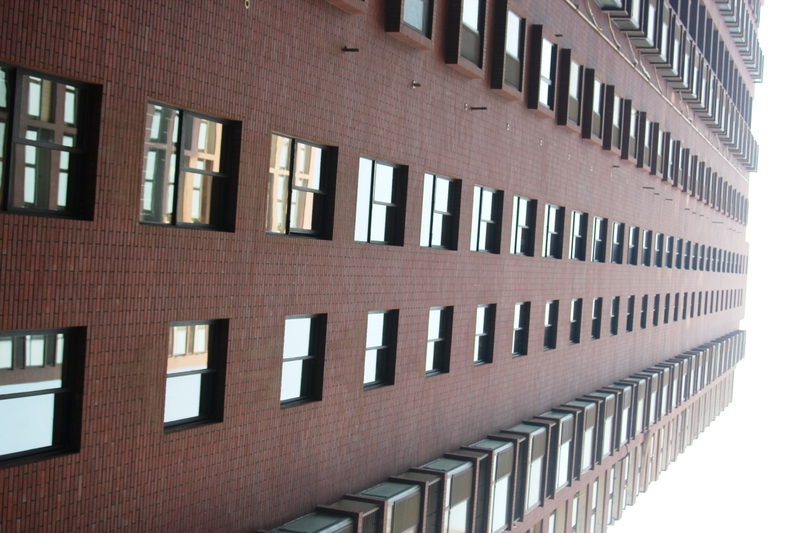 8/F ZhongBang Invesment Building, No.169 Middle Chang An Road, Xi’an, China. It’s my school (English First 1) and it’s safer to send anything there. It is also advisable to print the address in Chinese and paste on the letter along with the school’s phone number as sometimes the postmen can’t read Pinyin. And just in case here are our mobile numbers. I have no idea if they work for callers outside China. Skype is probably your best option, so e-mail us and we can arrange a time and date! Hi Dave and Kati! Wow sounds hectic! Printing out all your news and taking it home for Jay. Thank you for the news, thinking of you guys xxxxx Love from the rainy Zim!